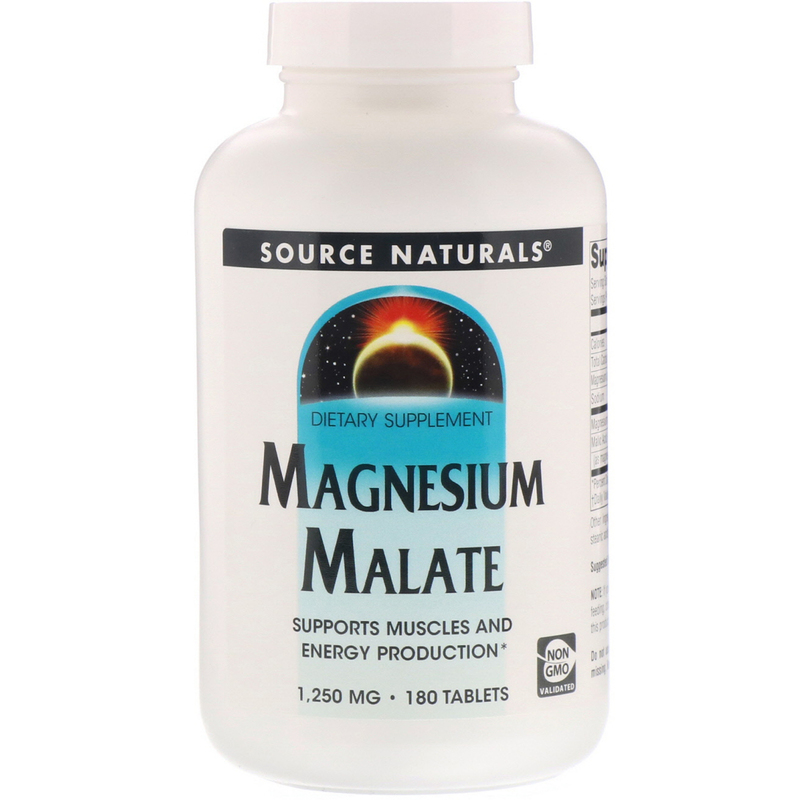 Source Naturals Magnesium Malate is a compound of magnesium and malic acid. 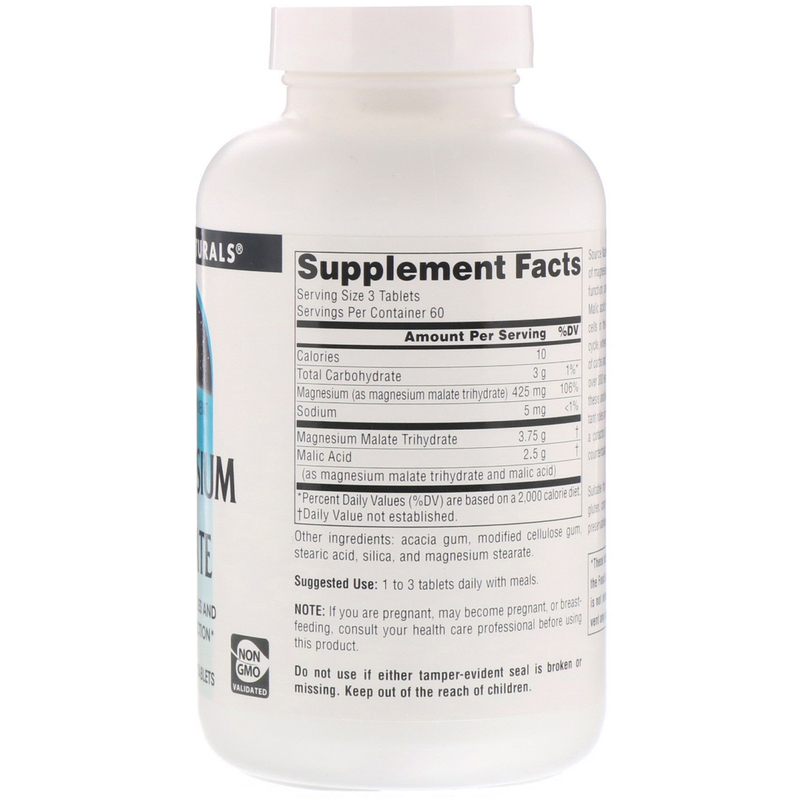 It supports proper muscle function, cardiovascular health, and energy production. Malic acid is a natural fruit acids that is present in most cells in the body and is an intermediate in the Krebs cycle, where energy is captured during the metabolism of carbs and fats. Magnesium is an essential cofactor for over 300 enzymatic reactions in metabolism, ATP synthesis and energy production. Magnesium plays important roles in muscle relaxation, because of its functions as a cofactor for enzymes and because of its ability to counterbalance calcium in the cell. Acacia gum, modified cellulose gum, stearic acid, silica, and magnesium stearate. Suitable for vegetarians. Contains no yeast, dairy, egg, gluten, corn, soy or wheat. Contains no sugar, starch, preservatives, or artificial color, flavor or fragrance. Hinweis: Falls Sie schwanger sind, schwanger werden könnten oder stillen, konsultieren Sie bitte Ihren Arzt, bevor Sie dieses Produkt benutzen. Nicht verwenden, falls das Authentizitätssiegel beschädigt ist oder fehlt. Außerhalb der Reichweite von Kindern aufbewahren.